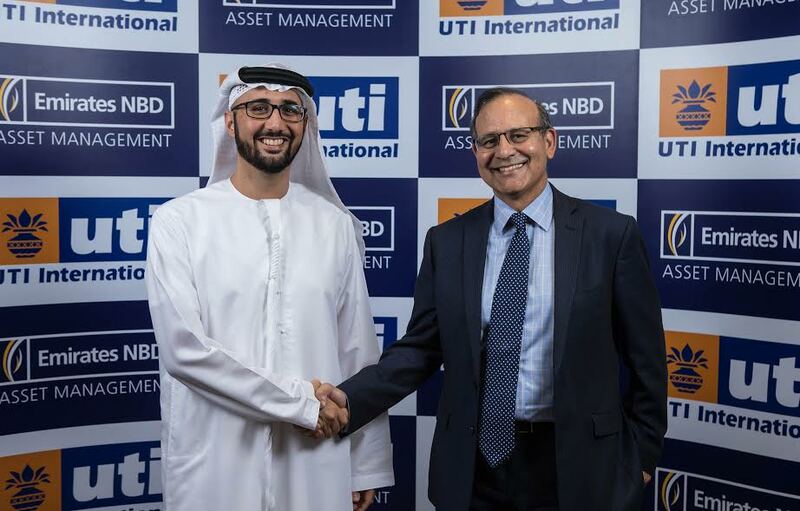 Dubai, United Arab Emirates: Emirates NBD Asset Management today announced its collaboration with UTI International, one of India’s largest money managers. The agreement aims to increase Emirates NBD Asset Management’s global fund portfolio. The partnership’s first fund will be the Emirates Islamic India Equity Fund, which will be managed by UTI and offer exposure to Shari’a compliant Indian equities. The agreement forms part of a strategy by Emirates NBD Asset Management to develop a portfolio of global funds with leading international partners. Among its current partners are Jupiter Asset Management, with whom the Company runs four different strategies. UTI International is the global arm of UTI Asset Management Company (India). The rationale for the agreement is driven by Emirates NBD Asset Management’s strong interest in India as a growth market for its overseas investment strategies. According to a McKinsey report, India’s economy is expected to be among the world’s top five by 2020 and to reach the top three by 2030. Demographically, India’s young population implies a favorable working population ratio, leading to higher levels of saving and higher spending potential. This is expected to sustain investments and prolong a high rate of GDP growth. India’s foreign exchange (FX) volatility is limited: the Indian Rupee has been a relative outperformer among emerging market currencies since 2015, while Indian FX reserves hit a record high of $363.5 billion in June 2016, providing a cushion during distressed periods. The new fund will build on Emirates NBD Asset Management’s existing SICAV, an open-ended collective investment scheme common in Western Europe. The platform already includes the Emirates Emerging Market Corporate Absolute Return Fund, the Emirates Islamic Global Balanced Fund and the Emirates MENA Fixed Income Fund, among others. Emirates NBD Asset Management Limited (Emirates NBD Asset Management), established in the Dubai International Financial Centre and regulated by the Dubai Financial Services Authority as a Category II Firm, is the wholly owned asset management business of Emirates NBD Bank, one of the largest banks by assets in the MENA region. Emirates NBD Asset Management provides a wide range of investment solutions, from in-house managed public funds to tailor-made discretionary solutions. It manages funds across a variety of asset classes, including MENA equity and global fixed income, global risk profiled solutions, UAE real estate, and a wide range of Shari’a compliant instruments, structured to cater for diverse risk appetites. Each of the Emirates NBD Asset Management managed funds are currently domiciled in either Jersey (regulated by the Jersey Financial Services Commission) or Luxembourg (regulated by the Luxembourg Commission de Surveillance du Secteur Financier). As at 30th June 2016, Emirates NBD Asset Management had assets under management of approximately USD 3.5 billion. UTI International Singapore Private Ltd is the flagship company representing the offshore interests of UTI AMC. It helps global investors invest in India. Current investors include private banks, family offices, Insurance companies, pension funds and other financial institutions. UTI Asset Management Company (UTI AMC), the parent entity, is the leading manager of Indian Equities, Fixed Income and Private Equity, with a robust investment process that has withstood the test of time. As a group, UTI has an AUM of USD 42 billion and manages money for more than 10 million clients. With Singapore as our primary place of business, UTI International aims to help global investors in accessing Indian equities, fixed income and private equity opportunities. These opportunities can be availed in multiple ways via Mutual Funds, Managed Accounts, Sub-Advisory and White Labelling arrangements. We also provide investors access to our domestic funds in India, through Master-Feeder arrangement. While the Research & Analysis is mostly conducted at our head office in Mumbai, we have an Investment Management team as well as a product structuring unit in Singapore. UTI started with humble beginnings. Created in 1964 by an Act of the Indian Parliament, UTI (or Unit Trust of India as it was known earlier) has a rich history of helping many generations of Indians plan their financial futures. By spawning Banks, Stock Exchanges and Depositories, it has also been instrumental in the development of the country’s Capital Market infrastructure.